Today is our last day in Xi'an. Because of the rain yesterday, the air has cleared up considerably and although cloudy we can see quite a ways today. 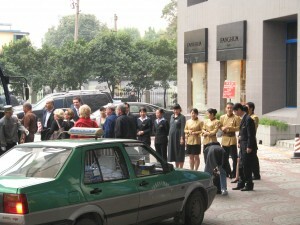 As we were waiting for our driver I was impressed when the hotel staff came out to line up and say farewell to a tour group that was leaving and boarding their bus. I don't understand why they didn't say goodbye to us like that. We started the morning off when our driver picked us up at the hotel. We made two stops on the way to the airport. The first stop was at the South Gate of the Xi'an wall. Our driver was excellent and comical. When we pulled up to the entrance to the wall he convinced the guard that we were visiting VIPs and that the guard should roll back the barricade so we could park right next to the wall. We all got a big chuckle out of that one. The wall surrounds the main downtown city of Xi'an and is approx 17 km long. It is wide enough to contain a least two lanes of car traffic (but doesn't). There are long stairs to climb to reach the top. The main gates contain shops (expensive) and viewing platforms. We watched a demonstration of ancient soldiers practicing the martial arts and then a music show before climbing the stairs, then, at the top of the stairs we watched a shadow puppet show for awhile. See the videos, below. We then walked a ways along the top of the wall viewing the city above roof top level. 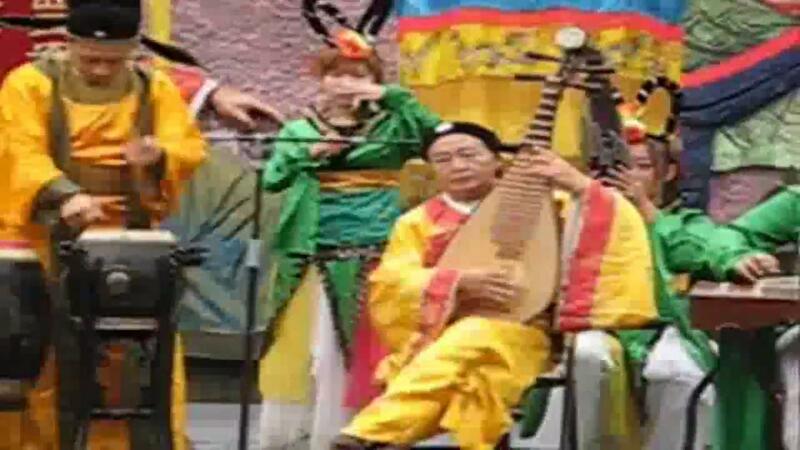 After that we visited another tomb of the 4th Han Dynasty. Approximately 225 - 157 BC. They have been excavating these tombs for about 30 years. In this excavation they have been much more careful about protecting the Terracotta figures, having learned from their mistakes at the more famous Terracotta Warriors excavation that we saw yesterday. These excavations have not been exposed to open light or polluted air and therefore have kept their original configurations. There are two tomb areas, one for the Emperor and another for his queen. The actual tombs have not been opened yet. 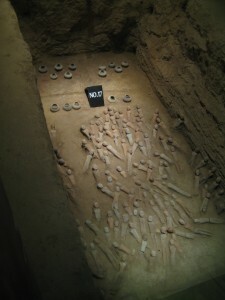 The work that has been done is excavating the pits leading up to the tombs. 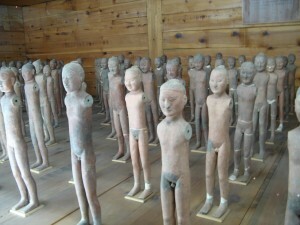 In these pits are the terracotta figures that were placed there to accompany the Emperor after death. These figures were soldiers, attendants, horses, pigs, chickens, dogs...anything that the Emperor felt would make his life easier in the afterlife before he returned to earth. It boggles the mind the size of the egos involved that would have thousands of figures created to be buried with him. We were very impressed with the professional presentation of the recovery, even viewing a holographic presentation, in English, of the history and background of the location. We then proceeded to the airport to wait for our flight to Beijing, which was late....while we waited we sat and enjoyed coffee and sandwiches at typical inflated airport prices, the equivalent of about $40 for two sandwiches and 6 cups of coffee. What a contrast to the family dinner we had the first night where we had that fantastic spread for less than the equivalent of $75. We arrived at the Beijing airport and did not have a gate, so we had to be bussed from the International area. We had stopped in the middle of a taxi way and a German tour group thought we were at the gate and started to unbuckle and take their luggage down. The attendants were going crazy trying to tell them to stop and sit down. They were totally ignored so I finally decided to tell them in German that we weren't there yet, Sit Down! Wow, it worked! We were met by my cousin's wife's brother, who lives in Beijing, where he owns a couple coffee shops and he took us to the hotel. He and his wife will show us around for the next three days.